A new exhibition at the V&A – Shadow Catchers – is a beautiful as it sounds. The first of its kind, viagra sale it explores the work of five key camera-less image makers. It was a concept that, find when it popped into the Amelia’s inbox, I found hard to get my tiny brain around – photographs? Without a camera? Of course, I’d experimented with making photographic images without a camera at college but the quality of images that the five artists create is astonishing. The exhibition is in the smaller gallery at the front of the grand building and is somewhat sidelined by the major Diaghilev retrospective, but shouldn’t be missed. It’s totally inspiring and tackles some thought-provoking concepts. Here’s a little look at the five artists that the show focusses on, each given their own room and space, along with some of their ground-breaking images. 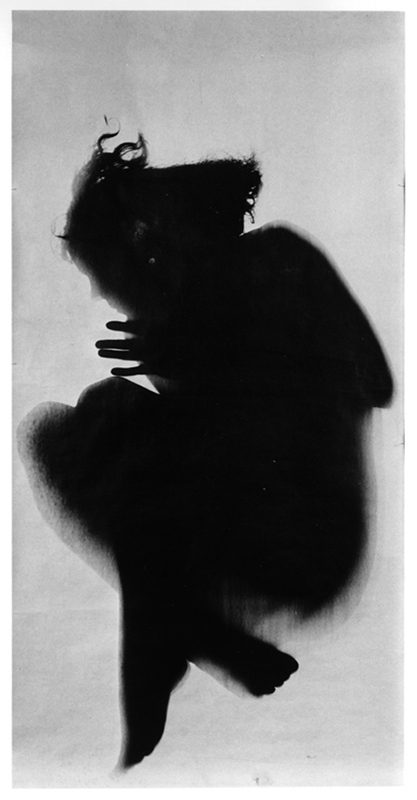 Floris Neusüss is the master of the photogram, a technique which involves placing an object on photo-sensitive paper before exposing both to light sources. He has devoted his entire career to this process – developing his work and teaching the concept to others. The most powerful of Neusüss’ work in his little area is The Latticed Window, Lacock Abbey, 2010. A life-size window from the Abbey is captured on photographic paper using light sources projected inside, and it is both imposing and relaxing at the same time – complete with all the dust and scratches as proof it is actually a photograph. Neusüss also made beautiful and powerful images of women in Europe in the 1960s. Untitled Berlin 1962 and Untitled Munich 1965 are great examples of this – these ethereal silhouettes in foetal positions appear both active and motionless at the same time, removing any trace of personal identity but urging the viewer to think about the models’ circumstances and character. 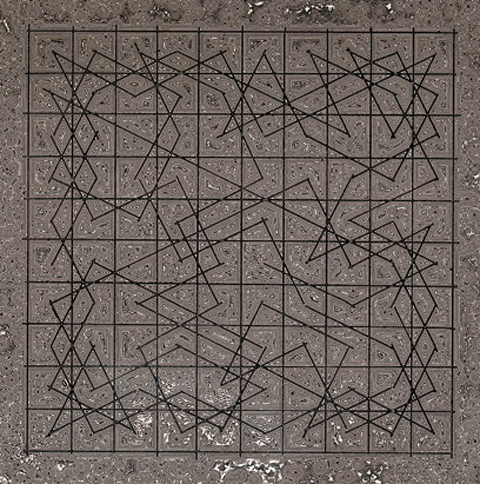 Cordier’s work challenges reality, aiming to produce ‘fake photographs of inaccessible reality’. 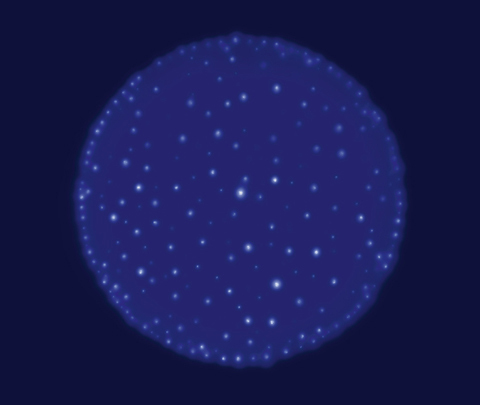 His chemigrams create interesting geometrical patterns and are an exercise in simplicity. His work airs more on the side of science than art, despite employing a moer artistic approach than other camera-less photographers. The most interesting thing to note is that Cordier’s process – protecting the surface of photographic paper with art materials – means that the images he creates are impossible to realise by any other means. I do like his work, but I couldn’t help thinking that the captions were a little pretentious. And, viewing immediately after Neusüss’ powerful images of people, Cordier’s just aren’t as captivating. Fabien Miller’s dominant piece in this exhibition is Petworth Window 2000 – using a similar technique applied by Neusüss at Lacock Abbey. Petworth House and its long façade of windows is most famously depicted in Turner’s paintings, so there’s a whimsical element to Fabien Miller’s photographic version. His work is the most futuristic of the artists presented – his pieces are totally hypnotic; some appear to pulse while others look almost lenticular. Delphinium 1-8 1990 charts the growth and adaptation of a single leaf over a single day, starting with discrete, delicate marks and resulting in an almost standard photographic representation of the object in question. 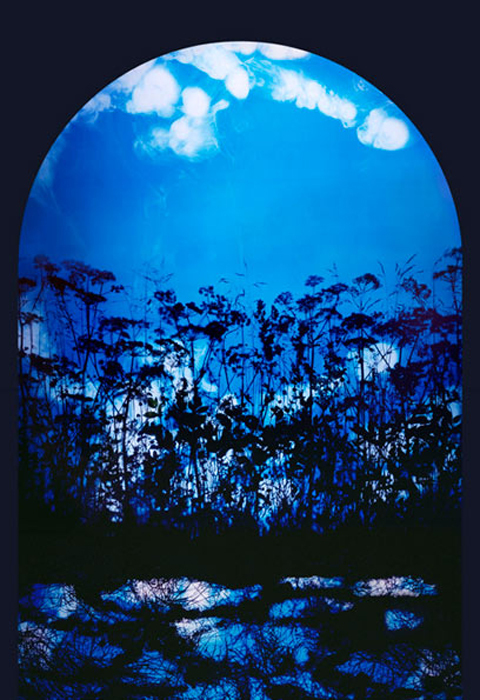 Derges’ work derives from an inherent interest in nature and how it is presented. It aims to reveal the hidden forces in nature that occur all around us but most go unnoticed. From sound waves to the flow of rivers, Derges captures unique patterns and formations in nature. River Tow 1997 appears almost like a charcoal drawing but is in fact a photographic record of patterns the river formed during an evening, using natural moonlight to expose the paper. The images are some of the most beautiful in the collection and made me want to run down to the Regent’s Canal at once to have a go. Vessel No. 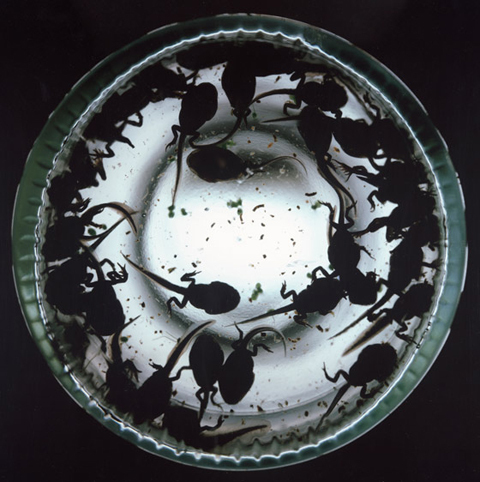 3 (1995) sees the transformation of toadspawn into fully grown frogs over a series of photograms – from the intricate patterns the spawn first makes to the messy network of adult toads. Finally, her Arch series, capturing the four seasons in ‘dreamlike landscapes’ which appear like church windows (above), shouldn’t be missed. So it’s to Adam Fuss to close this particular exhibition. The youngster of the group, Fuss began experimenting with camera-less photography in the 1980s. His work focusses on ‘the unseen’: events not usually documented in photography, rather than material forms. Invocation 1992 is an earnest piece of a newborn baby. 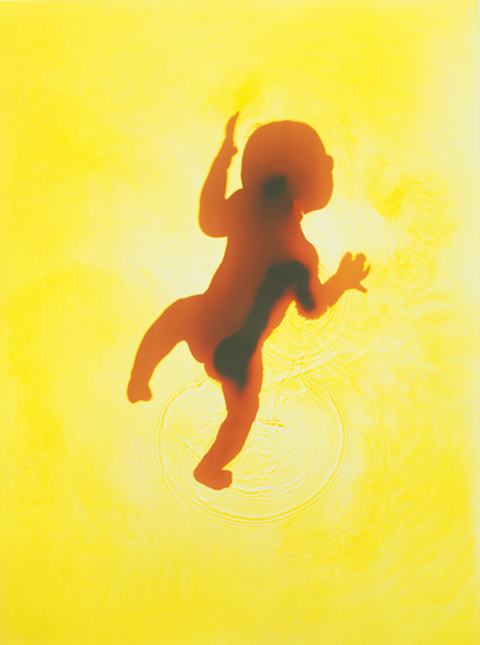 Placing the baby onto the paper, submerged in water, the result is the peaceful image of the child’s outline with delicate ripples surrounding him (or her) like a baptism. My favourites were contrasting pieces Untitled 1988 and Ark 1990 – the former depicting rippling waves and nature’s chaos, the latter displaying a serene, solo drop of water and it’s minute ripples. Works like My Ghost 1997 – an ethereal image of a christening gown likened to an x-ray, have a real impact; Fuss makes the simplest objects into fascinating works of art. This exhibition will fascinate anybody with the tiniest interest in photography and I came away feeling completely inspired. The works challenge both what we know of photography and how we think objects and nature that surrounds us every day can be depicted. Do go and see it – and catch the Diaghilev while you’re at it – you won’t be disappointed. Absolutely beautiful. Seeing the image of the tadpoles makes me feel so nostalgic.